This is the power of the Cisco® Digital Network Architecture (DNA). The Cisco Catalyst 3850 Series Switches support full IEEE 802.3at Power over Ethernet Plus (PoE+), Cisco Universal Power over Ethernet (Cisco UPOE), modular and field-replaceable network modules, RJ45 and fiber-based downlink interfaces, and redundant fans and power supplies. All switches ship with one of the five power supplies (350WAC, 715WAC, 750WAC, 1100WAC, or 440WDC). Figures 1 through 3 show the Cisco Catalyst 3850 Series Switches. Note: The C3850-NM-4-10G module is supported only on the 48-port Gigabit Ethernet models or on the 12-port or higher 10 Gigabit Ethernet models. The C3850-NM-8x10G and C3850-NM-2x40G modules are supported on the 24-port and 48-port multigigabit switches and also on the 24-port 10G SFP+ switch model. The C3850-NM-4-1G and C3850-NM-2-10G modules are not supported on the 12-port and 24-port SFP+ models. An SFP+ receptacle supports both 10 Gigabit Ethernet and Gigabit Ethernet modules, allowing customers to use their investment in Gigabit Ethernet SFP modules and upgrade to 10 Gigabit Ethernet when business demands change without having to do a comprehensive upgrade of the access switch. In contrast, SFP receptacles can be used only as Gigabit Ethernet ports, as shown in the examples in Table 4. Table 5 shows the different power supplies available in these switches and available PoE power. In addition to the power supplies listed in Table 5, a 440WDC power supply is available as a configuration option and also as a spare (that is, it can be ordered separately) on all switch models. The DC power supply also delivers PoE capabilities for maximum flexibility (refer to Table 6 for available PoE budget with DC power supplies). Customers can mix and match the AC and DC power supplies in the two available power supply slots. Any of these power supplies can be installed in any of the switches. In addition to PoE (IEEE 802.3af), the Cisco Catalyst 3850 Series Switches support PoE+ (IEEE 802.3at standard), which provides up to 30W of power per port. The Cisco Catalyst 3850 Series Switches can provide a lower total cost of ownership (TCO) for deployments that incorporate Cisco IP phones, Cisco Aironet®wireless LAN (WLAN) access points, or any IEEE 802.3at-compliant end device. PoE removes the need for wall power to each PoE-enabled device and eliminates the cost for additional electrical cabling and circuits that would otherwise be necessary in IP phone and WLAN deployments. Table 7 shows the power supply combinations required for different PoE needs. Cisco Universal Power over Ethernet (Table 8) is a breakthrough technology, offering the following services and benefits. Cisco Multigigabit Ethernet is a unique Cisco innovation to the new Cisco Catalyst Ethernet Access Switches. With the enormous growth of 802.11ac and new wireless applications, wireless devices are promoting the demand for more network bandwidth. This creates a need for a technology that supports speeds higher than 1 Gbps on all cabling infrastructure. Cisco Multigigabit technology allows you to achieve bandwidth speeds from 1 Gbps through 10 Gbps over traditional Cat 5e cabling or above. In addition, the Multigigabit ports on select Cisco Catalyst switches support UPOE, which is increasingly important for next-generation workspaces and Internet of Things (IoT) ecosystems. ● Multiple speeds: Cisco Multigigabit technology supports autonegotiation of multiple speeds on switch ports. The supported speeds are 100 Mbps, 1 Gbps, 2.5 Gbps, and 5 Gbps on Cat 5e cable and up to 10 Gbps over Cat 6a cabling. ● Cable type: The technology supports a wide range of cable types, including Cat 5e, Cat 6, and Cat 6a or above. ● PoE power: The technology supports PoE, PoE+, and UPOE for all the supported speeds and cable types. For more information, visit http://www.cisco.com/c/en/us/solutions/enterprise-networks/catalyst-multigigabit-switching/index.html. With mobility agents located in the wiring closets providing 40 Gbps of wireless per 48-port Gigabit Ethernet RJ45 switch (n x 40 Gbps for a stack of n switches) and mobility controllers managing some of the central wireless functions, the converged access-based wireless deployment provides best-in-class scalability for wireless and significantly improved wireless throughput. 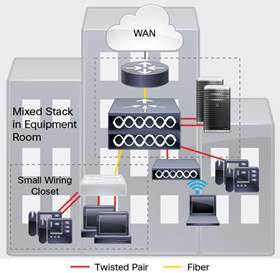 For more information about Converged Wired plus Wireless Access, refer to the Q&A document here: http://www.cisco.com/c/dam/en/us/products/collateral/switches/catalyst-3850-series-switches/cisco-catalyst-3850-series-switches-faq.pdf. The Cisco Catalyst 3850 switch has advanced wired plus wireless QoS capabilities. It uses the Cisco modular QoS command line interface (MQC). The switch manages wireless bandwidth using unprecedented hierarchical bandwidth management starting at the per-access-point level and drilling further down to per-radio, per-service set identification (SSID), and per-user levels. This helps manage and prioritize available bandwidth between various radios and various SSIDs (enterprise, guest, and so on) within each radio on a percentage basis. The switch is also capable of automatically allocating equal bandwidth among the connected users within a given SSID. This makes sure that all users within a given SSID get a fair share of the available bandwidth while being connected to the network. The UADP ASIC enables the hierarchical bandwidth management and fair sharing of bandwidth, thereby providing hardware-based QoS for optimized performance at line-rate traffic. In addition to these capabilities, the switch is able to do class of service (CoS) or differentiated services code point (DSCP) based queuing, policing, shaping, and marking of wired plus wireless traffic. This enables users to create common policies that can be used across wired plus wireless traffic. The Cisco Catalyst 3850 also supports downloadable policy names from the Cisco Identity Services Engine (ISE) when a user successfully authenticates to the network using the ISE. The Cisco Catalyst 3850 provides a rich set of security features for wired plus wireless users. Features such as IEEE 802.1x, port security, Dynamic Host Configuration Protocol (DHCP) Snooping and Guard, Dynamic ARP Inspection, RA Guard, IP Source Guard, control plane protection (CoPP), wireless intrusion prevention systems (WIPSs), and so on enable protection against unauthorized users and attackers. With a variety of wired plus wireless users connecting to the network, the switch supports session-aware networking, in which each device connected to the network is identified as one session, and unique access control lists (ACLs) and/or QoS policies can be defined and applied using the ISE for each of these sessions, providing better control on the devices connecting to the network. Cisco StackWise-480 technology is built on the highly successful industry-leading StackWise® technology, which is a premium stacking architecture. StackWise-480 has a stack bandwidth of 480 Gbps. StackWise - 480 uses Cisco IOS Software SSO for providing resiliency within the stack. The stack behaves as a single switching unit that is managed by an “active” switch elected by the member switches. A working stack can accept new members or delete old ones without service interruption. StackWise-480 creates a highly resilient single unified system of up to nine switches, providing simplified management using a single IP address, single Telnet session, single CLI, autoversion checking, autoupgrading, autoconfiguration, and more. 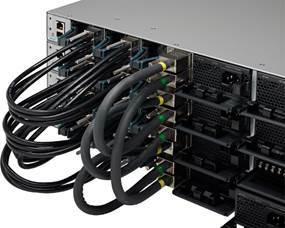 StackWise-480 also enables local switching in Cisco Catalyst 3850 Series Switches. ● Cisco Auto Smartports provide automatic configuration as devices connect to the switch port, allowing autodetection and plug and play of the device onto the network. ◦ AV Bridging provides reliable time synchronized transmission with no pops or clicks or video dropouts. ◦ AV Bridging provides reliable A/V streaming without the need for the installer to perform extensive hand tuning of the network. ◦ Stacking master configuration management with Cisco StackWise-480 technology helps make sure that all switches are automatically upgraded when the master switch receives a new software version. Automatic software version checking and updating help ensure that all stack members have the same software version. 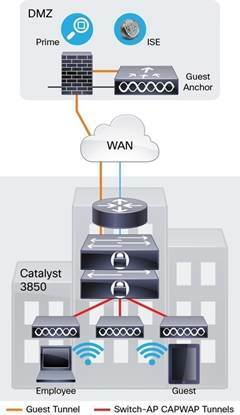 ◦ Optimized multicast for wired plus wireless: Cisco Catalyst 3850 offers greater multicast efficiency by receiving only one multicast stream and replicating it for all connected wired plus wireless devices connected to that switch. ● Cisco Discovery Protocol Version 2 allows the Cisco Catalyst 3850 Series Switches to negotiate a more granular power setting when connecting to a Cisco powered device such as IP phones or access points than what is provided by IEEE classification. ● Per-port power consumption command allows customers to specify maximum power setting on an individual port. Per-port PoE power sensing measures actual power being drawn, enabling more intelligent control of powered devices. The Cisco Catalyst 3850 Series Switches offer both a superior CLI for detailed configuration and Cisco Prime™ infrastructure for unified wired plus wireless management. Prime infrastructure provides day 0 and ongoing provisioning, ongoing monitoring and maintenance, configuration templates, and device and user 360-degree views and serves as the FNF collector for user traffic views using the Prime Assurance Manager module. ◦ IP source guard prevents a malicious user from spoofing (that is, taking over) another user’s IP address by creating a binding table between the client’s IP and MAC address, port, and VLAN, and by using it to selectively block bogus packets. ◦ The Unicast Reverse Path Forwarding (uRPF) feature helps mitigate problems caused by the introduction of malformed or forged (spoofed) IP source addresses into a network by discarding IP packets that lack a verifiable IP source address. ◦ Bidirectional data support on a SPAN port allows the Cisco intrusion detection system (IDS) to take action when an intruder is detected. ◦ Private VLAN edge restricts traffic between hosts in a switch by segregating traffic at Layer 2, turning a broadcast segment into a nonbroadcast multiaccess like segment. Private VLAN edge provides security and isolation between switch ports, which helps ensure that users cannot snoop on other users’ traffic. ● IEEE 802.1s Multiple Spanning Tree Protocol (MSTP) provides rapid spanning-tree convergence independent of spanning-tree timers and also offers the benefit of Layer 2 load balancing and distributed processing. ● Per-VLAN Rapid Spanning Tree (PVRST+) allows rapid spanning-tree (IEEE 802.1w) reconvergence on a per-VLAN spanning-tree basis, providing simpler configuration than MSTP. In both MSTP and PVRST+ modes, stacked units behave as a single spanning-tree node. ● Switch-port autorecovery (“err-disable” recovery) automatically attempts to reactivate a link that is disabled because of a network error. ● Policy-based routing (PBR) allows superior control by facilitating flow redirection regardless of the routing protocol configured. The IP Base feature set is required for PBR. Virtual routing and forwarding (VRF)-Lite enables a service provider to support two or more VPNs, with overlapping IP addresses. The IP Services feature set is required for VRF-Lite. Cisco IOS Software FNF is the next generation in flow visibility technology, allowing optimization of the network infrastructure, reducing operation costs, and improving capacity planning and security incident detection with increased flexibility and scalability. The Cisco Catalyst 3850 provides optimized application visibility with FNF across wired plus wireless. The switch is capable of up to 48,000 flow entries on 48-port models and up to 24,000 flow entries on 12-port and 24-port models across wired plus wireless. With UADP ASIC, Cisco Catalyst 3850 delivers next-generation flow technology with unprecedented flexibility and comprehensive visibility extending from Layer 2 (MAC and VLAN) to Layer 4 (TCP/UDP) flags and so on across wired plus wireless traffic. The Cisco Catalyst 3850 switch is Medianet capable to provide visibility and troubleshooting capabilities across wired plus wireless video traffic. Specific Medianet features will be enabled in future software updates. The flow data collected by FNF can be exported to an external collector for analysis and reporting or tracked by the EEM. The Cisco Catalyst 3850 enables powerful on-box and customizable event correlation and policy actions with EEM, allowing the switches to trigger customized event alarms or policy actions when the predefined condition is met. With no external appliance required, customers are able to use existing infrastructure to perform traffic monitoring, making traffic analysis economical even on a large IP network. With Cisco IOS® XE Software Release 16.3, Cisco Catalyst 3850 MultiGigabit and 3850 10G SFP+ now support the IEEE 802.1 AVB standard. This standard provided the means for highly reliable delivery of low-latency, time-synchronized AV streaming services through Layer 2 Ethernet networks. The standard also makes it easier to integrate new services and for AV equipment from different vendors to interoperate. Whether the AV endpoint connections are analog or are inflexible digital one to one, the network transport enables many-to-many transparent plug-and-play connections for multiple AV endpoints. In a campus-type deployment, operating the Cisco Catalyst 3850 in the mobility agent mode and centralizing the mobility controller functionality in a WLC 5760, WLC 5508, or WiSM2 helps achieve better scalability and performance. The Cisco Catalyst 3850 provides CAPWAP termination for access points, uniform policy enforcement for wireless clients, better wireless bandwidth, and uniform Cisco IOS Software-based configuration and monitoring for wired plus wireless features. The mobility controller provides central mobility, RRM, and CleanAir coordination. 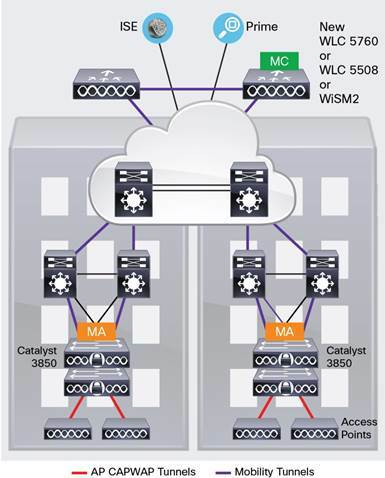 Backward compatibility with traditional centralized wireless deployment mode on the WLC 5508, WiSM2, and WLC 5760 helps ensure that customers can migrate to the Cisco Catalyst 3850-based converged access approach in phases, providing a continued controller for existing access points. This migration also provides investment protection on the existing wireless controller infrastructure. A phased adoption of the new Cisco Catalyst 3850 helps ensure that migration to the converged access mode of wireless is seamless. Figure 10 shows a Cisco Catalyst 3850 in the campus type deployment. The Cisco Catalyst 3850 is optimized for branch deployments when it operates in mobility controller mode. In this mode, not only can the switch terminate CAPWAP tunnels from the access points and provide client connectivity, it can also manage mobility within the branch. This eliminates the need for a local controller in every branch in addition to the access-layer switches. Also, complete visibility into the wired plus wireless traffic means that the WAN router can prioritize the right wired plus wireless traffic in and out of the branch. Figure 11 shows a Cisco Catalyst 3850 in a branch access type deployment. The new 12-port and 24-port SFP+ or SFP-based Cisco Catalyst 3850 models as well as the nonstackable 48-port SFP+ model can also be used in the branch to aggregate traffic from smaller access switches through fiber links for more secure and EMI-sensitive deployments (Figure 12). Table 9 shows Cisco Catalyst 3850 Series Switches performance specifications. Table 10 shows dimensions, weight, acoustic, mean time between failure (MTBF), and environmental range. Weight does not include an uplink FRU. Weight includes the chassis assembly as it is shipped (with fans), one power supply and, and one power supply slot blank. Table 11 shows the supported connectors. ● Customers can provide power to a switch by using either the internal power or StackPower from another member in the power stack. The connectors are located at the back of the switch.● Internal power supply connector: The internal power supply is an autoranging unit. The internal power supply supports input voltages between 100 and 240VAC. Use the supplied AC power cord to connect the AC power connector to an AC power outlet. Table 12 shows management and standards support for the Cisco Catalyst 3850 Series. Table 13 lists the power specifications for the Cisco Catalyst 3850 Series based on the kind of power supply used. Table 14 shows power consumption of standalone Cisco Catalyst 3850 Series Switches based on Alliance for Telecommunications Industry Solutions (ATIS) testing using IMIX distribution stream traffic, with input voltage of 115VAC at 60 Hz and no PoE loading. The values given are the maximum possible power consumption numbers under the respective test scenarios. Table 15 lists the safety and compliance information for the Cisco Catalyst 3850 Series. For further information about warranty terms, visit http://www.cisco.com/go/warranty. Table 16 provides information about the E-LLW. Applies to Cisco Catalyst 3850 Series Switches. Cisco will provide during business hours, 8 hours per day, 5 days per week basic configuration, diagnosis, and troubleshooting of device-level problems for up to a 90-day period from the date of shipment of the originally purchased Cisco Catalyst 3850 product. This support does not include solution or network-level support beyond the specific device under consideration. The Cisco Catalyst 3850 Series Switches with LAN Base feature set can only stack with other Cisco Catalyst 3850 Series LAN Base switches. The same applies to IP Base and IP Services as well. A mixed stack of LAN Base switch with IP Base or IP Services feature set is not supported. The 12-port and 24-port SFP+- and SFP-based models as well as the 48-port SFP+ model can only be ordered with IP Base or IP Services licenses. Therefore, in order to stack with LAN Base models, they need to be configured in LAN Base mode from the CLI. Customers can transparently upgrade the software feature set in the Cisco Catalyst 3850 Series Switches through Cisco IOS Software CLI using the right to use (RTU)-based software upgrade process. Software activation enables the Cisco IOS Software feature sets. Based on the license’s type, Cisco IOS Software activates the appropriate feature set. License types can be changed, or upgraded, to activate a different feature set. An access point license is required for Cisco Catalyst 3850 operating in mobility controller mode. No access point license is required for 3850 operating in mobility agent mode. This functionality is included in the IP Base feature set. Other devices that can act as mobility controller are the WLC 5760, WLC 5508, and WiSM2 wireless controllers. Access point licenses can be transferred only between two 3850 switches or between 3850 and 5760 controller and vice versa. Customers with Cisco Catalyst LAN Base and IP Base software feature sets will be provided with maintenance updates and bug fixes designed to maintain the compliance of the software with published specifications, release notes, and industry standards compliance as long as the original end user continues to own or use the product or up to one year from the end-of-sale date for this product, whichever occurs earlier. Customers with licenses for our IP Services software images require a service support contract such as Cisco SMARTnet™ Service to download updates. This policy supersedes any previous warranty or software statement and is subject to change without notice. Cisco ONE Software for Access Switching is available for the Cisco Catalyst 3850 Series Switches. For ordering information for Cisco ONE Software for the Cisco Catalyst 3850 Series Switches, go to http://www.cisco.com/c/en/us/products/software/one-access/switching-part-numbers.html. Enable the innovative, secure, intelligent edge in the Borderless Network Architecture using personalized services from Cisco and our partners. Through a discovery process that begins with understanding your business objectives, we help you integrate the next-generation Cisco Catalyst fixed switches into your architecture and incorporate network services onto that platform. Sharing knowledge and leading practices, we support your success every step of the way as you deploy, absorb, manage, and scale new technology. 1Cisco operating system updates include the following: maintenance releases, minor updates, and major updates within the licensed feature set.2 Advance hardware replacement is available in various service-level combinations. For example, 8x5xNBD indicates that shipment will be initiated during the standard 8-hour business day, 5 days a week (the generally accepted business days within the relevant region), with NBD delivery. Where NBD is not available, same day ship is provided. Restrictions apply; for details, review the appropriate service descriptions. Table 18 lists ordering information for the Cisco Catalyst 3850 Series. To place an order, visit the Cisco Ordering homepage at http://www.cisco.com/en/US/ordering/or13/or8/order_customer_help_how_to_order_listing.html.